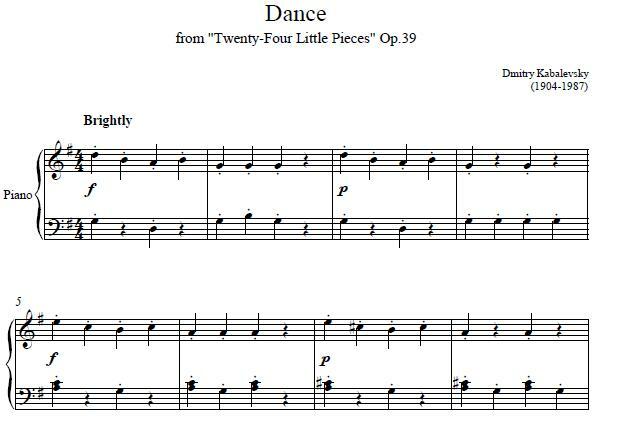 The piano composition Dance, was written by Dmitry Kabalevsky, and published in 1972, in his book, Easy pieces: 24 pieces for children: op. 39; 35 easy pieces: op. 89: for piano. The Russian composer had a checkered history, and became a member of the communist soviet party in 1940. His post war work has been described as bland yet successful, though many composers from this period were also described in this fashion. Kabalevsky was known for his work in helping youth with music; he wrote music that bridged the gap between childhood technical ability and adult aesthetics. Also, he set up a special music program for soviet schools (25 of them), and held high ranking educational posting is Russia, and within the former Soviet Union. While in Russia he is most noted for his vocal songs, cantatas and operas, in the western world his orchestral compositions are more popular.